Dubai is now home to the largest inflatable aqua park in the Middle East. 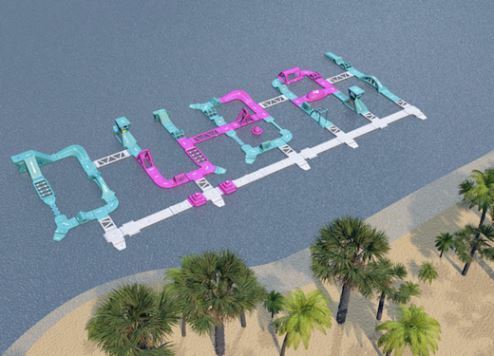 ​The giant inflatable obstacle course named Dubai Aqua Park, located in Jumeirah Beach Residence, has been designed in the shape of Dubai’s official logo, which reflects the city’s name in both English and Arabic. The 77-metre course, which can hold up to 500 people at one time, comprises a maze of inflatable ramps, slides, bridges and towers. “Our mission is to create happy memories for families and for youth,” said Ahmed Ben Chaibah, founder of ​the park’s designer Aqua Fun. ​Dubai Aqua Park opened on 1 September. But it’s not the only inflatable aqua park in Dubai. JA Jebel Ali Golf Resort also boasts its own floating water park. The JA Wibit Water Park is located just offshore at the resort’s private beach.